There are 53 Assisted Living Facilities in the Boynton Beach area, with 12 in Boynton Beach and 41 nearby. The average cost of assisted living in Boynton Beach is $2,692 per month. This is lower than the national median of $3,346. To help you with your search, browse the 342 reviews below for assisted living facilities in Boynton Beach. On average, consumers rate assisted living in Boynton Beach 3.9 out of 5 stars. Better rated regions include Lantana with an average rating of 4.0 out of 5 stars. Caring.com has helped 10 families in Boynton Beach find high-quality senior care. To speak with one of our Family Advisors about assisted living options and costs in Boynton Beach, call (855) 863-8283. Boynton Beach is located on the east coast of Florida, north of Delray Beach and south of Palm Beach. Seniors make up 21.6 percent of the population in Boynton Beach, and to accommodate them, there are 11 assisted living facilities (ALF) located in the Boynton Beach area and 45 in nearby cities like Lantana, Delray Beach and Lake Worth. Regulated by the Florida Agency for Health Care Administration (AHCA), ALFs operate under a standard or specialty license. The Boynton Beach area is home to world-class medical facilities, including the Bethesda Hospital East, in the event of medical emergencies or illness. Florida is one of seven states that doesn't have a state income tax, and that includes retirement income such as pensions and SSI benefits. Seniors on a tight budget may find some extra breathing room in Boynton Beach. With an average low of around 58 degrees, Boynton Beach has seasonal year-round temperatures. Summer highs average about 90 degrees which is ideal for those who enjoy being outdoors, although it's often humid. The cost of living in Boynton Beach is slightly higher than the average U.S. city. Seniors may find more affordable living in nearby Delray Beach or Lake Worth. Crime is a problem in Boynton Beach. With 6.6 violent crimes per 1,000 residents per year, the city's crime rate is about 50 percent higher than the state average, and the property crime rate is even worse. Transportation options include Palm Tran's Seniors in Motion program that offers reduced fares at more than 3,200 bus stops around the county. Envoy is another Boynton Beach transportation option for seniors, that provides concierge services at a low cost. Assisted Living costs in Boynton Beach start around $2,692 per month on average, while the nationwide average cost of assisted living is $4,000 per month, according to the latest figures from Genworth’s Cost of Care Survey. It’s important to note that assisted living rates in Boynton Beach and the surrounding suburbs can vary widely based on factors such as location, the level of care needed, apartment size and the types of amenities offered at each community. 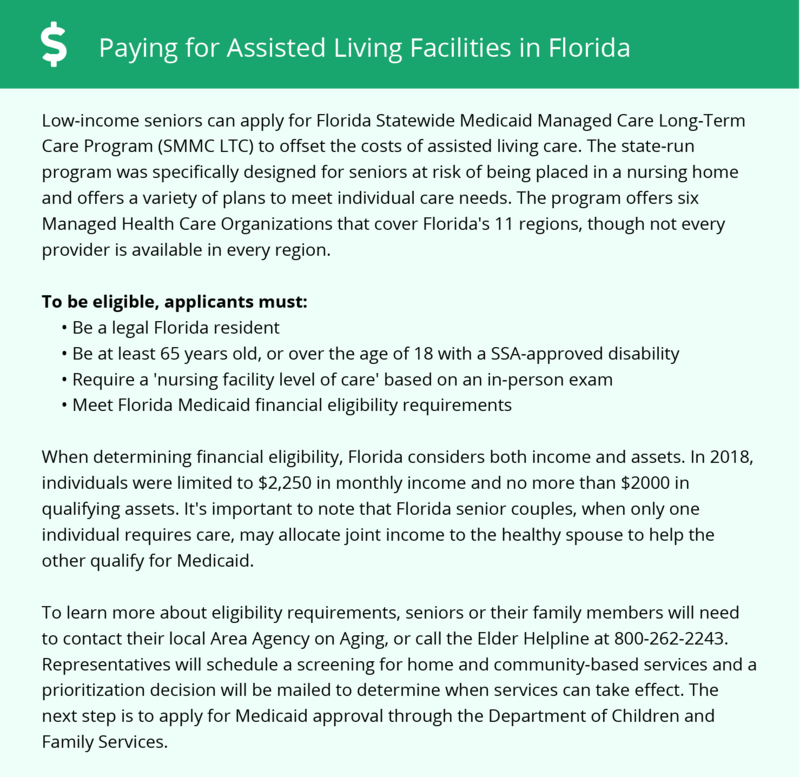 Individuals needing assistance for ALFs in Florida may be eligible for the Medicaid Long-Term Care or Assistive Care Services programs. Seniors receiving Federal SSI benefits may also receive optional state supplementation (OSS), which is a financial grant for low-income individuals living in residential care facilities. To see a list of free assisted living resources in Boynton Beach, please visit our Assisted Living in Florida page. Boynton Beach-area assisted living communities must adhere to the comprehensive set of state laws and regulations that all assisted living communities in Florida are required to follow. Visit our Assisted Living in Florida page for more information about these laws.